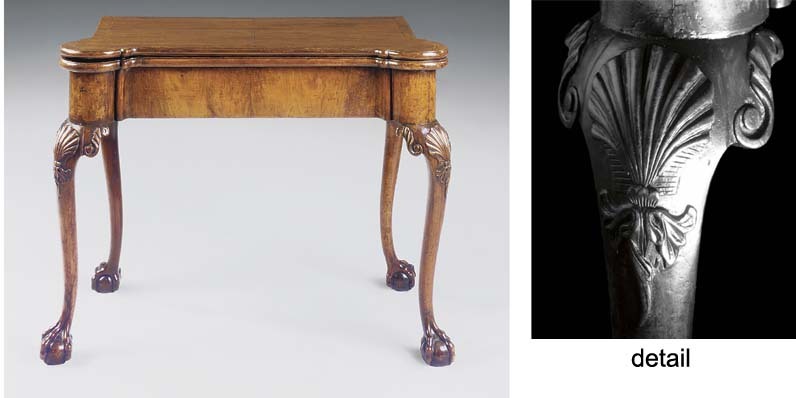 This pier/card-table is designed in the George II Roman fashion with columnar or compass-tablet corners and trussed legs enriched with Venus-shell badges and terminating in Jupiter eagle-claws . Such tables would have been designed en suite with parlour chairs, such as those with compass fronts and 'vase' splats, formerly in Lord Vernon's collection (sold Christie's London, 26 May 1960, lot 22). A similar table bears the label of the St. Paul's Church Yard cabinet-maker, Benjamin Crook (fl. 1732-1748) (C. Gilbert , Pictorial Dictionary of Marked London Furniture 1700-1840, Leeds, 1996, fig. 265).